The earliest documented ancestor, Christopher Lister of York, mercer, was admitted to the Freedom of the City of York in 1652/53. Before 1752, England used the Julian Calendar and also began the official year on Lady Day, 25 March, rather than 1 January. Thus all dates in January and February and most of the dates in March are cited as a year earlier than we would now consider them to be. Since Freemen were apparently inducted in February, "1652/53" would mean Feb 1652 Old Style or what we think of as Feb 1653. See Wikipedia on the confusing change from the Julian to the Gregorian calendar. Ann Luntley notes: Presumably Christopher served his apprenticeship in the normal way, serving seven years in his trade and thus becoming eligible to apply for the Freedom; unfortunately the apprenticeship records and applications for Freedom do not survive before 1659. Mercers were Merchant Adventurers whose Company still has a grand building in York and is very active. William's son Mathew Lister (that is how he signed his name in his will) of York, grocer and merchant (b. c. 1700 d. 1755 - New Malton, Yorks. ), was admitted to the Freedom of the City by patrimony, 1732/33. He was active in the York council, being elected to various offices such as Chamberlain and Sheriff. He became an Alderman in 1749 (after 15 years as a Freeman, so it seems to have been by seniority) and Lord Mayor in 1750. (This office seems to have been taken in turn by the next longest-serving Alderman who could decline and pay a fine if he did not wish to serve.) Mathew acquired the estate of Heigholme Hall, Leven (about 11 km NE of Beverley), in 1742-43 and 1750-52, though it may be that nobody in the family ever actually lived there. He married three times, each time in New Malton: the first marriage (4 Feb 1727 in St. Michael's, New Malton) was to Frances Mannel (b. c. 1702 d. before 1743, New Malton); the second, celebrated at St Leonard's New Malton on 7 May 1743 was to Elisabeth Thorp, widow; the third, in the same church on 28 Dec 1751, was to Frances Thompson, spinister. Mathew Lister had a sister Catherine in New Malton for whom he took out Letters of Administration as next of kin. He may also have had a brother James, described as a son of William Lister of Welham, who was apprenticed to an apothecary for eight years in 1706 but does not appear in the Freedom rolls - perhaps he died. From his will it may be inferred that Mathew Lister was a very wealthy man with property and silver goods in abundance, and only two sons to share it. His will mentions four surviving children: William was left a half share in the house in which he lived at New Malton as well as an interest in two other properties, items of silverware and his brewing vessel (so he may have been a brewer as well as a grocer). James was made sole executor. There were two daughters, Dorothy wife of Jeremiah Coultas who had a daughter called Frances. The other daughter was Mary Griffith who may have been a widow as no husband is mentioned. The other legatees were Mathew's sister Mary Sands and her son Lancelot who both lived in Ireland (again no mention of a husband), and his grandson Mathew who was mentioned after James and may have been his son. Hayholme Hall is described in 1857 (History and Topography of the City of York, etc. by J. J. Sheahan and T. Whellan) as 'a commodious erection of modern date'. Hayholme Grange itself is said to be 'ancient and moated round', but it doesn't seem to be there any more on the 1855 Ordnance Survey map. The original grange probably stood at 53°54'20.75"N, 0°20'30.99"W. Colin Platt's Medieval England describes Heigholme as on 'the sodden flood plain of the river Hull'. Sukie Hunter comments: "Indeed it looks extremely dull and flat." We have no evidence that the Listers actually lived there, since the locus of their activities seems to have been either York or Malton/Filey/Scarborough. This would mean James was the eldest son who inherited the Hall and William was the younger son who went off to York to take advantage of his right to become a Freeman. In fact, William Lister was admitted to Freedom of the city by patrimony, 1759; he held office for Wallgate ward in York in 1784; and died on 2 Oct 1798, leaving a widow (who died in York aged 79). Dorothy Humpton Lister, wife of the above James Lister, was the third child of Richard Humpton b. c. 1705. (This is probably the Richard Hampton or Humpton who married Dorothy Grindall at St Martin & St Gregory, York, on 7 August 1729.) She had an older sister Frances (baptised 10 Oct 1731) and a brother Richard, a soldier who migrated to America: Richard Humpton "of the Township of West Bradford, County Chester, Pennsylvania" (b. Yorks. 1733 d. 20 Jan 1805) was a captain in the British army (36th Regiment Foot) and was present during the 1758-59 siege of St. Malo, northern France, during the Seven Years War. While subsequently stationed in the West Indies, he resigned his commission, moved to Pennsylvania and settled on the upper reaches of the Susquehanna river. In the War of Independence, he fought as a colonel on the American side, receiving orders directly from General George Washington. He m. Elizabeth Morris on 11 March 1795 in Philadelphia PA (she d. Philadelphia 1828) and at one time is said to have been the owner of the Mount Pleasant Estate. He conditionally left part of his estate to his "nephew, Richard Humpton Lister of North Riding, Yorkshire, Kingdom of England". This legacy was put into effect, to the benefit of RHL's heirs, by the will of RH's widow Elizabeth, even though RHL himself had predeceased her by some years. See 1836 court case in the Supreme Court of Pennsylvania. It is not clear what the relationship was with another benefeciary Lewis Edwards Humpton - a son or perhaps another nephew? 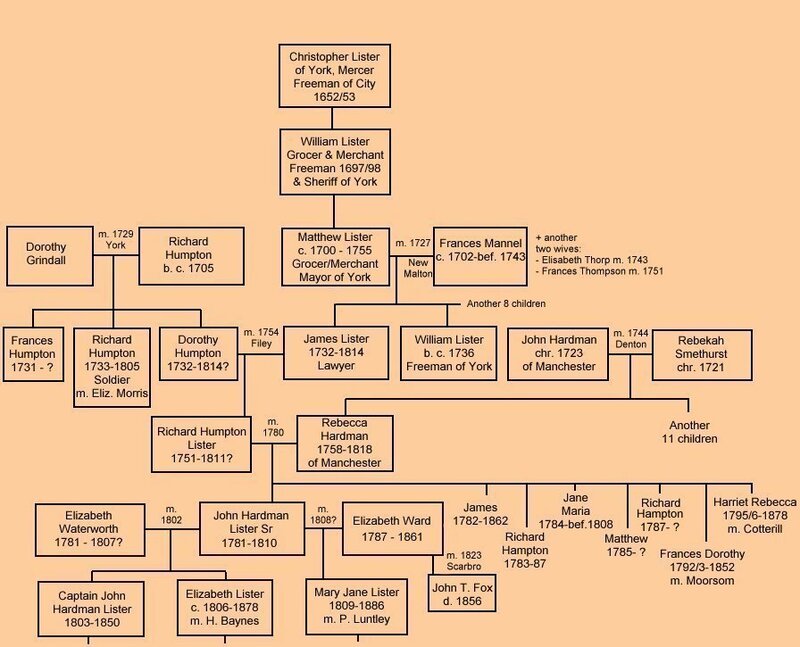 LEH, his wife Mary and their children Richard, Elizabeth M., Ephraim and perhaps Mary, along with a certain Elizabeth Humpton Meares, presumably a niece, were all beneficiaries in some degree of the wills of Col. Richard Humpton and his widow Elizabeth. Richard Humpton Lister, son of James Lister and Dorothy Humpton, attorney-at-law in Scarborough was b. 1751 and m. Rebecca Hardman (chr. 21 May 1758, Saint Ann Manchester, Lancs. d. 1818 London) in Manchester Cathedral on 31 July 1780. He sold the Heigholme Hall estate in 1802. From Richard Humpton Lister's will of 11 April 1806 we learn that his bride Rebekah (or Rebecca) brought a dowry of £2,630; that they lived on the west side of Queen Street, Scarborough; and that he also owned property in Reighton, Bewholme and Fylingdales, Yorks. RHL d. 1811 (buried in Filey, nr. Scarborough). Rebecca survived him until 1818 (d. in Bow, London), having made a will in 1815. She was the eighth child (of 12) of John Hardman (chr. 1 Mar 1723 in Manchester) and Rebekah Smethurst (chr. 24 Sep 1721 in Manchester) who were married in St Lawrence Parish, Denton, 27 Dec 1744. We do not know much about the Hardmans but they must have been well-to-do if Rebecca, just one of 12 children, had such a large dowry. Her brother Joseph was baptised on the same day, so may have been her twin. He is said to have been wounded in Canada and to have died of the wounds. Richard and Rebecca had eight children of whom only five were still living at the time of her will in 1815, viz. Frances Dorothy b. 1792/3 m. George Moorsom, Stepney 1819, d. Bethnal Green RD 4Q 1852. At least two sons, John and George. Harriet Rebecca (bap. Scarborough 31 May 1796), who as the youngest must have been her mother's favourite since she received an extra bequest of £500. She appears in the Pedigree of Cotterill as she married William Henry Cotterill, a solicitor of Throgmorton Street, London 'at Saint Bartholomew by the Exchange, London, 22 Sept 1821'. The eldest child of Richard and Rebecca's family, who had died by the time of his mother's above-mentioned will, was John Hardman Lister Sr, b. 19 May 1781 in Scarborough, Yorks., d. Mar 1810, Ship Owner. He m. 27 July 1802 in Whitby Elizabeth Waterworth b. 1781, Scalby, Yorks. daughter of Benjamin Waterworth and Elizabeth Allison). Elizabeth Waterworth Lister, after giving birth to John Hardman Lister Jr (later "Captain Lister", 1803-1850) and his sister Elizabeth (1806-1878), died an early death in Scarborough, probably in 1807. Soon thereafter, JHL Sr married Elizabeth ("Betty") Ward b. Sledmere Yorks. 1787, daughter of Jefferson Ward, bearing him Mary Anne Lister (1809-1886) - see below. John Hardman Lister Sr died at the age of 28 and was buried in York on 16 Mar 1810. His widow Betty remarried in Scarborough on 5 April 1823. Her new husband was John Tyreman Fox, a chemist (d. Scarborough RD 4Q 1856). She died in 1861. "Captain" John Hardman Lister was born Scarborough 20 Aug 1803. His story is told on the main Captain Lister page. Both his parents having died by the time he was 6½, he and his sister must have been brought up by their stepmother, Elizabeth Ward Lister, and/or their grandmother, Rebecca Hardman Lister, a wealthy widow. Elizabeth Lister Baynes appears as a widow in the 1861 and 1871 censuses, in the latter case at White Lodge, 75 Grove Lane, Camberwell, Surrey, as a 65-year-old stationer employing 7 persons. She seems to have died in Camberwell RD 2Q 1878, aged 72. JHL's younger half-sister Mary Jane married Philip James Luntley, "oil refiner" and druggist, at St Nicholas Olave, London, 11 September 1830. Philip Luntley had been baptized 1794 at Maze Pond Baptist church, Southwark. He was a poor businessman and had been made bankrupt in 1828, two years before his marriage. The couple had approx. 9 children. They seem to have moved from the City to Greenwich in about 1838 and thence to Stepney before the 1851 census. After her husband's death in Stepney 4Q 1853, Mary Jane returned to Scarborough where she figures as an "Aerated water manufacturer" (1861) and "Lodging house keeper" (1871). In these activities she was assisted by various of her children. By 1881 Mary Jane (71) had retired and was living on 'Income from houses' and the lodging house. She died in 2Q 1886, aged 76, and the lodging house business was carried on by several unmarried daughters. The younger son, Washington Luntley, went to Leeds where he was joined by several cousins and aunts.